The PS3 is a veritable multimedia centre. Aside from the obvious BluRay playback, it also offers MP3 playback, and surprisingly, it will upscale DVD and DivX movies to hi-def quality. 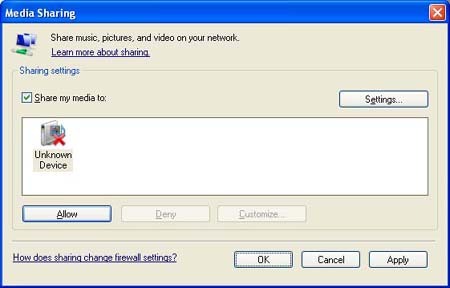 However, you will first need to have a network at home using either a wired or wireless router to be able to share the data on your PC with your PS3. "But how? Tell us Blokeh! How is this possible?". Well, I'll tell ya. There's three ways you can do this. 1. 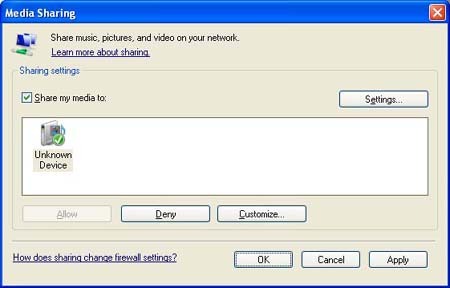 Get Windows Media Player 11. While anyone with a Windows XP or Vista machine has WMP11, this surprisingly isn't the best option. 2. 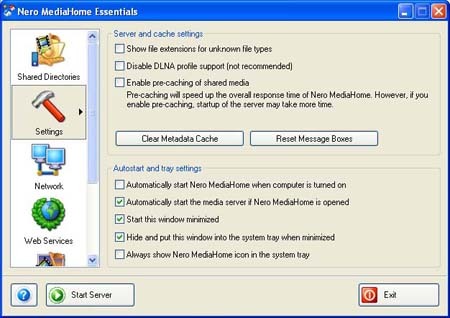 Use Nero MediaHome. This comes with Nero 7 onwards, and is obtained either by buying a CD/DVD writer, downloading Nero MediaHome here, or otherwise "obtaining" a copy of Nero 7 from "teh intarwebs", if you "know what I mean", but you do this at your own risk. 3. Use TVersity - the setup is essentially identical to the 360 version, so go check it out if you fancy this option. Anyways, I'm going to show you the first two ways to do this, so lets start with WMP11. Start up your PS3 and leave it alone. Then head to your PC and start up WMP11. Click "Tools", then "Options". You will see the following set of tabs. 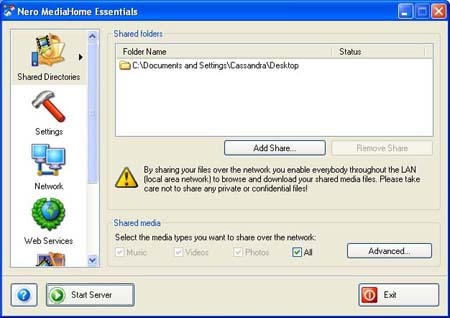 Click "Library" then "Configure sharing". You will see this box. Put a check in the "Share my media" box and hit "OK". WMP11 will then pause for a minute while it prepares itself, then you will see this box. The "Unknown device" is your PS3. Click it and then click "Allow". It will now look like this. Click "Apply" then "Settings" to see this box. You can name your connection whatever you want, but make sure the rest of the options are set as this. Then click "OK". Keep clicking "OK" til you get back to the first box with all the tabs, and in the "Library" one, click "Monitor folders". You should be presented with this box. Here, add the folders you wish to share. Some are already shared, but you can add any old folder you wish by clicking the "Add" button. Once you click "OK", you'll see this. This will take AGES to update, as it will add each and every shared file to WMP11, ready for sharing. Once done, hit the PS3 and go to any of the Music, Photo or Video sections. If you can't see the PC already, simply hit "Search for media servers" and the PS3 will scan the network til it finds WMP11 and all the shared files. Then, its a case of simply browsing the media centre and watching or listening to whatever you want! 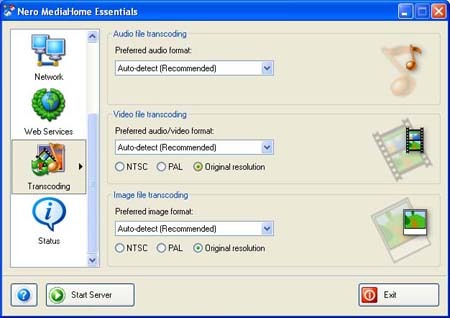 You can also save the files to your PS3 by hitting triangle and selecting "Save". 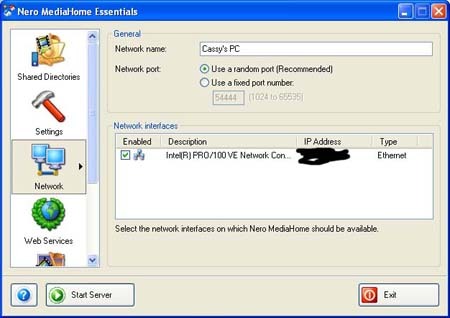 But as I said before, there is a better option, and its name is Nero MediaHome! 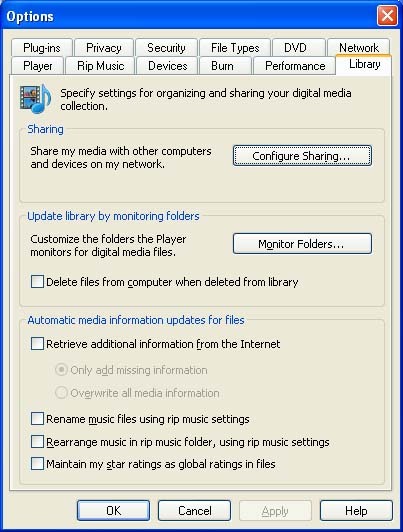 Once you've installed Nero MediaHome, open it up and you'll get this set of options. 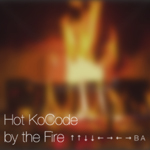 I'm using Nero MediaHome Essentials (bundled with Nero 7), so you might see slightly different options. Click the "Add share" button to add more folders to, well share! Once done, move on to "Settings" in the menu down the left. Set the options as you see here. Also, if you wish to have the server boot up when your PC boots up, check the "Auto start when computer is turned on" box. Hit "Network" to see this, setting it thus. Select the options as you see here. And that's that! You're all set. Hit "Start server" to, well, start the server! Yes, it's THAT bloody simple! Again, if it doesn't automatically appear on your PS3, hit "Search for media servers" to find it, and you'll find it. Then browse and watch away. WMP11: Takes forever to set up and slows your PC to a crawl but navigating via PS3 is quick. NMH: A few seconds to set up and no effect on running the PC, but navigating via PS3 has a slight delay of no more than a second or two between folders.